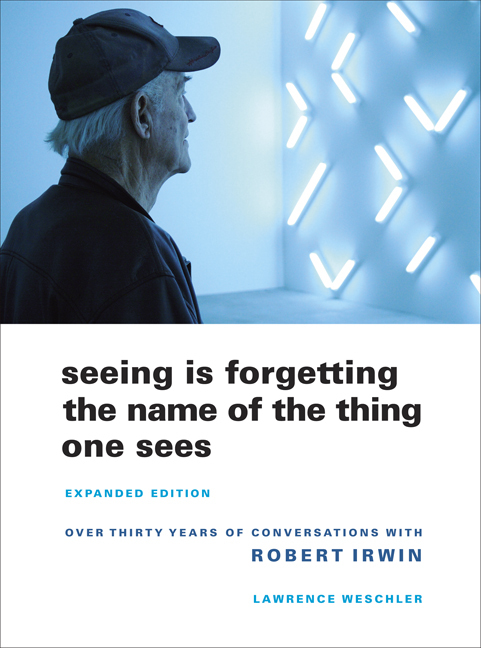 At the heart of Seeing Is Forgetting the Name Of the Thing One Sees (1982/2009), Lawrence Weschler’s biography of the artist Robert Irwin, are two intertwined and reoccurring ideas: presence and perception. Irwin (1928-), an American conceptual/installation artist, began his art career in the 1950s with paintings of lines and dots, then, in the 1960s, moved to painting round aluminum discs. By the 1970s he had gone beyond what he felt were the arbitrary edges of canvas and art object to take on the museum spaces themselves as the subject matter of his installation art. Since the 1980s, Irwin has worked on permanent outdoor installations intended to enhance their environments. In the process, his work has become ever less material, and increasingly concerned with getting us to experience a perceptual state in which we notice ourselves noticing. As Weschler meticulously documents his subject’s evolution through copious interviews, what happened was that Irwin, a self-taught artist, came to realize that art is not about the art thing as much as the experience such things (or spaces) can engender. “It’s about presence, phenomenological presence” (61) he says. Irwin came by his realization organically, early in his career. While working on paintings, he became frustrated by the tendency of his images to signify and the impossibility of a “neutral gesture” (60). Was there a way to escape this? A way to “maximize the energy or the physicality of the situation and minimize the identity or idea or imagery of the situation”? (90) What Irwin wanted was presence without representation, “a reduction of imagery to get at physicality, a reduction of metaphor to get at presence” (200). Presence as affect, as materiality, as spirit, as feeling, as structure. Remarkably, Irwin came to his insight about the importance of presence by spending massive amounts of time just staring at his works in progress. In looking for extended periods he began noticing differently: “paying attention to my own sensibility and taking stock of it and deciding that too many things in there simply didn’t make sense” (67). Tweaking his work, removing material instead of adding it, Irwin developed a stance in relation to his work that could enlist boredom as “a very good tool” (73). In paying attention, he “just attended to the circumstances, and after weeks and weeks of observation, of hairline readjustments, the right situation would presently announce itself” (74). Eventually, the right situation would entail jettisoning the conventional equipment of art making and taking on, literally, less material projects. Irwin tells Weschler that some of the inspiration for this shift towards installation art came from drives he took into the California desert. Here and there, Irwin would sense (“intuition is about sensing facts before they materialize” ) something powerful and stop the car to go investigate on foot. He realized that it would be pointless to artistically “mark” such spaces with his own designs, yet was nevertheless inspired by how a naturally occurring space could have such powerful affect. Ultimately, for Irwin presence and perception are a set of relations that constitute the real subject matter of art. “We’re not really aware of what takes place otherwise, the so-called incidentals, the information that takes place between things,” he says, “the kind of things that happen around, the multiple interactive relations” (148). Reading as I often do with musical things in mind, I found Seeing Is Forgetting one of the more energizing books I’ve come across in a while. To start, it got me thinking about the idea that music is not in the musical object (e.g. score, performance, sounds) but in our perception of it. (True, musics have social lives too, but that’s another matter.) In other words, we pursue music in pursuit of various kinds of presences that give rise to various perceptual shifts. Second, the book also got me thinking through a sonic analog of its title, which might read: Hearing Is Forgetting The Name Of What One Hears. In other words, Irwin reminds us to focus on the what rather than the what does it mean aspect of creating. Lastly, Irwin’s work–not to mention Weschler’s elucidation of it–is a reminder of the vitality of the arts as a kind of intuitive, presence- and perception-oriented inquiry that is open-ended and without goals. As Irwin tantalizingly sums up the equation that implicates us all: “we are the question, and what we are is what we have to contribute” (120).